We have new pictures of the upcoming Barbie dolls for 2019 and links, that will help you get them! Young designers can create unique, fresh looks for Barbie doll with fresh fruity scents -- choose from strawberry or pineapple. Each doll has a scented head, fruit decal and accessories that include a pair of shoes and a shaped purse with an adorable face. The three fashions include two hydrochromic pieces, a skirt and dress -- dip the Crayola paintbrush tool into the water bucket and use it on the items to magically reveal a colorful fruit pattern. It's so cool! let them dry to return to the original state and then start all over. Ken doll is ready to dive into fantastical fun as a Merman with colorful mermaid tail and removable necklace. Wrist-cuff details are sea-worthy, and articulation at the waist allows storytelling action. Barbie doll is ready to celebrate someone's special day with a festive look and wrapped present. Her pink dress has a shimmery top and sparkly skirt; silvery shoes and a necklace complete the party look; and her silvery gift with pink bow matches, too! say, happy birthday!" with Barbie doll. 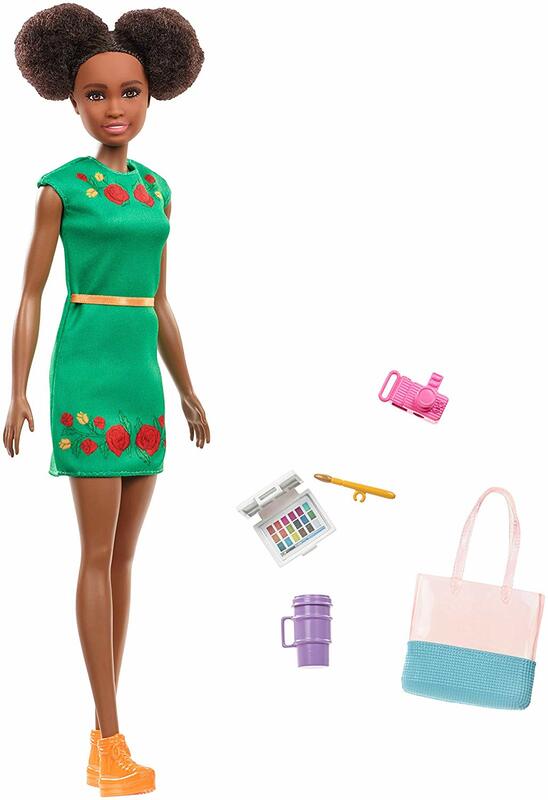 Nikki doll is ready to paint the world with this set that includes more than five accessories. She looks picture-pretty in a bright green dress with floral accents and orange shoes. Art supplies include a sketchbook (with image), watercolor paint palette and brush the doll can hold. Chelsea doll and her puppy are ready for an adventure around the world with this travel set that includes more than five accessories. Chelsea doll has luggage (a roller bag with clip that attaches to her hand and backpack), travel accessories (like headphones and a cellphone) and personal must-haves (like a teddy bear). she's dressed to go anywhere wearing a pink sparkly skirt, pink shoes and pink sunglasses, and her puppy has an excited expression for the trip. Skipper doll is ready to see the world with this set that includes four accessories to inspire artistic and adventurous storytelling: a pair of binoculars, a backpack, a camera and a tablet. She wears a versatile travel outfit of gray top, plaid short, black pants and red shoes and has a signature streak of color in her hair.